After a 5-1 finish in the pool rounds on Friday, the 2018 Senior Pan American bronze medalist advanced to Saturday’s competition with a 15-8 victory over Olga Hramova (BUL) in the preliminary table of 64. Exempt from the preliminary rounds, two-time Olympian Wozniak started the day with a 15-10 win over Yingjia Ma (CHN) and controlled her bout against Svetlana Kormilitsyna (RUS), 15-8, to reach the 16, where she lost to an up-and-coming fencer for France, 18-year-old Sarah Noutcha (FRA), by a score of 15-12. 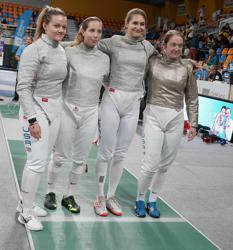 The reigning World Championship bronze medalist, Eliza Stone (Princeton, N.J.) fenced teammate Francesca Russo (Wayne, N.J.) in the 64 for the second time in the last month. While Russo won their bout in a comeback at the October North American Cup, Stone took the lead early at 8-3 and didn’t let up, winning the bout, 15-12. Her run came to an end in the 32, however, when she dropped her table of 32 bout to Lucia Martin-Portugues (ESP), 15-10. Competing in her fourth senior international event, 18-year-old Nora Burke (New York, N.Y.) was a perfect 6-0 in pools on Friday to take the No. 3 seed and a bye to Saturday’s event. Burke drew 2016 Olympic team bronze medalist Monica Aksamit (Matawan, N.J.) in the 64 and led the bout at 13-10 before Aksamit fought back with four straight to take a 14-13 lead. Burke scored again to tie the bout and took the final touch for a 15-14 win. Burke earned her second top-32 finish at a senior event after a 15-12 loss to two Junior World bronze medalist Liza Pusztai (HUN). Now ranked No. 8 in the senior standings, Burke’s point haul from the top-32 finish also moves her up to the No. 5 position in the Junior National Rolling Point Standings as she seeks to qualify for her first Junior World Team next season. On Sunday in the team event, Zagunis, Wozniak, Stone and Aksamit represented Team USA with the squad finishing just short of a medal in fourth place. The U.S. didn’t drop a bout in its table of 32 matchup against Poland, advancing to the quarter-finals, 45-32. To clinch a place in the medal rounds, Team USA earned a come-from-behind victory over Korea, which has won team medals at the last two World Championships. Down 30-27 after six rounds, the United States won the final three bouts, outscoring Korea, 18-10, to win the quarter-final, 45-40. Zagunis won all three of her bouts, tallying a +8 indicator. In the semifinals, Zagunis gave Team USA a 25-24 lead over top-ranked France going into the sixth, but the defending World Champions won three of the final four bouts to hand Team USA a 45-41 defeat. Team USA would find itself in another close bout in the bronze medal match. Facing the 2017 World Team Champions, Italy, the Americans were down just one after the second bout. In the third, Wozniak fenced well against 2015 Junior World Team Champion Sofia Ciaraglia, but injured her ankle late in the bout. Wozniak finished the round, but Italy pulled ahead by one at 15-13. Stone defeated three-time individual World Cup medalist Martina Criscio, 6-5, in the fourth and Zagunis shifted the momentum for Team USA with a 6-1 lead in the fifth to put the Americans up, 25-21. Aksamit came in as a substitution for Wozniak and upset two-time individual Senior World medalist Irene Vecchi, 5-1, to give the Americans an eight-touch lead at 30-22 heading into the seventh. However, Italy rebounded and secured the match, 45-43, by winning the final three bouts.